Archies Thongs for arch support are super comfortable and supportive! Choose Archies Thongs for great support this summer! Flat thongs not giving you enough support? 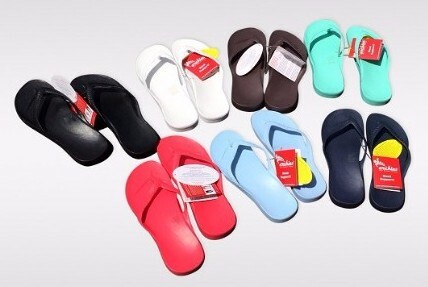 Try our super comfortable arch support thongs! As the warmer weather has arrived, we thought it would be a great time to let you know about a fantastic new summer product we have come across that you may benefit from! The new product is called, “Archies Arch Support Thongs” and they are an orthotic thong that were designed by a Physiotherapist. We stock a range of colours and sizes at $35 a pair. While the concept of orthotic thongs is not new, this design varies greatly from anything we have ever seen before as they incorporate legitimate orthotic support but still just look like normal thongs! We all love wearing thongs, however there are many negative effects of flat thong wearing. The “Archies” arch support thongs will certainly be a more suitable alternative. The most obvious problem with typical thongs is that they are flat and offer the feet no support. This can be a problem for all foot types, especially those who over pronate. Pronation occurs when the foot rolls inwards. When the foot rolls in so too does the lower limb/leg, causing a disruption to the body’s natural alignment. Increased pronation alters the way that stress and strain are absorbed through the body, which can potentially lead to injury. One of the other biggest problems with typical thongs is that they often come with a very loose strap. Normally when you walk your toes are supposed to bend upwards which activates the arch of the foot which then provides protection and support to the vital structures of the feet. However, most typical thongs have a very loose strap which means that you end up clawing / scrunching your toes down just to try and keep the thongs on your feet. When the toes claw / scrunch down rather than bending up, the arch does not activate and as a result your foot is subject to increased stress and strain. Archie’s Thongs have been designed with a much tighter strap than normal thongs which allows for proper foot function to occur which allows you to walk more naturally. Most thongs are also very flat in the heel section with little to no elevation which can put a lot of stress and strain on the calf and Achilles, thus predispose to problems such as Achilles tendinopathy. “Archie”s support thongs” elevated the heel and unload the achilles, thereby providing relief from constant stress. “Archie’s Arch Support thongs” have done a brilliant job on solving these key design issues. Archie’s Thongs are well and truly the most comfortable thong you will ever wear and once you get used to them you will not want to take them off!